Brownie Toffee Crunch is shipping! Sit back, relax, and enjoy a delicious cup of JavaPodz coffee . . . Since 2005, JavaPodz gourmet specialty coffee has offered something delicious for every coffee lover. JavaPodz offers aromatic and delightful gourmet coffees in caffeinated, decaffeinated, flavored, and unflavored varieties. Order single-serve coffee soft pods, ground coffee, and whole bean coffees. USPS Priority shipping to U.S. destinations is only a flat $9 with orders under $75 or more. Free USPS Priority shipping for orders of $75 or more. Free coffee pod sample that can be selected during order check-out. is savoring the aroma of the pod just after opening its wrapper. That's almost as wonderful as its taste on your palate! Our pods work with many pod brewing machines including Senseo, Melitta, Hamilton-Beach, Bunn and others. 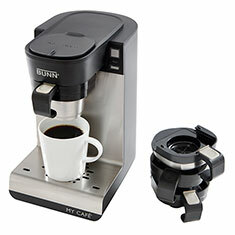 and the Bunn My Cafe MCU that works with our podz as well as ground coffee and Keurig cups. If you already have a Keurig cup brewer, try the Pod Holster to use our podz. This special JavaPodz Banjo Blend is a unique Italian (medium) roast combining an ideal selection of beans grown in Central and South America, and a strum of Papua New Guinea. This blend might encourage you to pick up the banjo and start pickin' and strummin' ! A dark, French Roast subtle combination of beans from coffee farms from a seven countries around the world (Colombia, Peru, Sumatra, Nicuragua, Mexico, Ethiopia, and Guatemala). With the aroma and each sip, imagine being everywhere in the world at the same time (whoa). It's a hyperspheric experience! Our classic light roast delivering smooth, yet rich, coffee flavor. Our espresso specialty darkest roast best highlights the temperate climate, rich volcanic soil, and high elevation of carefully selected arabica coffee. This dark roast of Colombian Supremo offers a bold, robust cup of coffee. Our medium roast bringing out the rich, full-bodied flavor of the classic Colombia Supremo bean. The classic American craze of rich flavor with sweet highlights wrapped in an Italian (medium) roast. Applying an italian roast to a combination of coffees from Nicaragua, Peru, Indonesia, and Ethiopia to produces a memorably heady and intense cupping experience. Brian's first concoction is a cosmopolitan representation of the four primary coffee-producing continents. Our italian roast is darker than viennese but lighter than french. A medium roast, delivering smooth yet rich coffee flavor. The naturally decaffeinated version of our classic dark french roast; robust for the palate...and half the decaf! SERC is Socially and Environmentally Responsible Coffee (SERCtm). Socially and Environmentally Responsible Coffee is a combination of being organically-grown, providing adequate shade and shelter to birds, and being purchased from the farming cooperatives at fair trade prices (25-45% above regular natural coffee prices). All of our coffee varieties are SERC. SWP means that the coffee is decaffeinated using the premium SWISS WATER® Process (SWP) that uses only water when removing caffeine. All of our decaf coffees are SWP. For orders of $75 or more, $5 off. Use Coupon Code 5A75 during checkout. For orders of $100 or more, $10 off. Use Coupon Code 10A100 during checkout. For orders of $300 or more, $39 off. Use Coupon Code 39A300 during checkout. For orders of $500 or more, $75 off. Use Coupon Code 75A500 during checkout. For orders of $1,000 or more, $200 off. Use Coupon Code 200A1000 during checkout. For orders of $1,500 or more, $375 off. Use Coupon Code 375A1500 during checkout. Try a variety of your favorite flavor or roast. Over 50 coffees in a variety of flavors and roasts. Check out our Quick-Picks. SERC, our Socially & Environmentally Responsible Coffee brand, and Water / CO2-processed decafs. We publish current discounts and specials in a box on our home page. To order quantities greater than 600 pods (mix or match), please contact us using the Customer Support form. 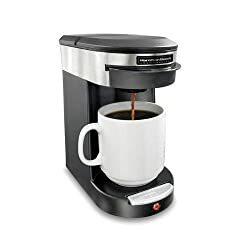 Pod Brewer? If you're new to our site and looking for single-serve coffee pods, please make sure that your pod brewer is listed on our known compatible brewers page. Our pods fit all brewers that accept standard pods, as well as ones that use K-Cups by using the reusable pod holster. Visit our Support page to request help or contact us directly. Also view the contents of your shopping cart (if it isn't empty), manage your account, track your order, check your gift certificate balance, or join our mailing list.